~2012. London played host to an international event - the Olympics. It was the opening ceremony however that had everyone captivated. The Danny Boyle vision included a James Bond scene with the Queen, a montage of British music and films and the world of employment from the NHS to the Industrial Revolution. Unbelievably, that was already six years ago and it was also during this time that an event in Morecambe began which lifted aspects of an era when the NHS began back in 1918. 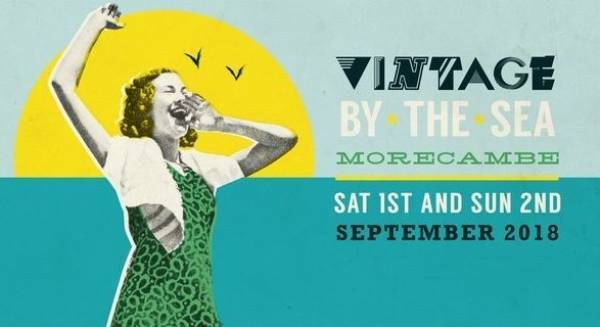 Vintage by the Sea is returning to the sunny sands of Morecambe this weekend ( 1st and 2nd September 2018). Created by Wayne and Geraldine Hemingway the 2 day event captures the 1920’s in a fun and innovative way. Wayne Hemingway MBE, Gerardine Hemingway MBE and Jack Hemingway launched Vintage Festival in 2010, building festival experiences that have won awards from Visit England, Festival Awards and the London Vintage Awards for events including Vintage Glasgow at Merchant City, A Vintage New Year’s eve at London’s Southbank, Classic Car Boot Sale and Vintage by the Sea. In addition there are festival favourite performers Jean & Morag and Viv the Spiv parading the promenade, award-winning street food from vintage vehicles and classic cars. The Guys & Doll’s Vintage Hair Boutique, Vintage fairground rides & inspired art workshops, there’s something for everyone to enjoy at this year’s Vintage by the Sea. Saturday 1st September to Sunday 2nd September 2018.